We’d love your help. Let us know what’s wrong with this preview of Power Trip by Amanda Little. To ask other readers questions about Power Trip, please sign up. If you're a cognizant citizen, and don't spend all your days at medieval fairs, then you have a baseline knowledge of these topics. What I find most interesting--and refreshing--is that the author, despite a Jane Bagley Lehman Award for excellence in environmental journalism, didn't really know the extent to which America is built on coal and oil until she began research for this book. What that means is, she earned a well-paid living writing magazine articles about the environment for Outside, New York Times, Vanity Fair, Rolling Stone, Wired, In Style, Men's Journal, and Washington Post as an ostensible 'Expert' without spending the 2 years necessary to write a book. In other words, as she drilled down (yep, that's a pun) into the topic, she became more aware of her own complicity in being dependent on oil. This is not a book of self-discovery, but it is a genuine expression of her gullibility and ignorance--like all of our own ignorance when the subject is broken down in detail. I think Amanda Little originally viewed herself as a low-carbon-footprint kinda girl; a 'green,' young, urban, professional hottie. It was nice to see her admit her culpability in adding her own small part to the crisis. 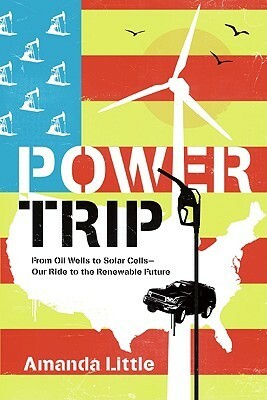 "Power Trip" may not be the most comprehensive or technical book on energy issues, but it is one of the most broad reaching, upbeat, and fair minded. Amanda Little offers a solid overview of our harnessing and use of energy evolved over the past 150 years or so, explores both the benefits and costs of these developments, and covers a wide range of emerging ideas about how we can move forward with improved efficiencies, new technologies, and the use of renewables. Little's persistent accentuation "Power Trip" may not be the most comprehensive or technical book on energy issues, but it is one of the most broad reaching, upbeat, and fair minded. Amanda Little offers a solid overview of our harnessing and use of energy evolved over the past 150 years or so, explores both the benefits and costs of these developments, and covers a wide range of emerging ideas about how we can move forward with improved efficiencies, new technologies, and the use of renewables. A series of interesting stories about America's energy addictions...oil, the military's dependence on oil, plastics, cooking oil, the extended food transportation chain. But its a little unfocused, whereas Oil on the Brain (the oil industry vertical chain), Powering the Dream (renewable energy), and Bottled Lightning (battery tech and lithium in particular) benefit by comparison because they were more focused and had a more central message. An environmentalist friend of mine recommended this book, and I gave it a shot. I couldn't finish it - I got too turned off by the early chapters which were (depending on your viewpoint) woefully incorrect or merely overcome by events (i.e. declaring firmly that there won't be any more major oil finds on land, when earlier in 2012 the US discovered vast land-based oil reserves). The rest of the book may be good, but I didn't stick around to find out. I searched for this book specifically to give it a 5* rating. I've actually bought this book for other people as well - because I was so impressed with it. Every chapter was full of information and I kept wondering how she could continue with such clarity and intrigue... but she did... all the way to the end. The facts and background laid out in the book made such an impact on me that I've never looked at mainstream news the same again. It's a quick, easy read, and a good introduction to the big issues facing the U.S. as it tries to wean itself off oil and boost renewable energy. If you don't know much about energy, or aren't convinced that we need to change our ways, this is a good place to start. Overall the tone is light and optimistic. It doesn't shy away from the big challenges. But it also doesn't delve much into the politics or psychology that's been holding back progress on making this transition. Another solid entry into the history of renewable energy category, but also includes a little more of a journey across America approach where the author profiles communities, individuals and organizations that are embracing the energy independence movement. In fact the book probably leans more towards the latter element than the former, but it was an enjoyable read. I should have given up on this book when, at about page 45, the author wrote, "The current imbroglio in Iraq, I learned through my research in 20th century military history, was hardly the first war caused by oil." I loved this book.So many cool stories about America's oil history.Many of her chapters deal with politics but she remains bipartisan in her attitude.The Power Trip educated me,inspired me and gave me hope. Fantastic book. Not only does the book provide the history of how U.S. has come to dependable on fossil fuels to allow our society to function, but also outlines what new technologies that are beginning to emerge that will replace fossil fuels. Excellent read. This filled in some of my energy blanks, but I was hoping for something a little more technical. Well researched, great writing, and very informative. Along with "Hot Flat and Crowded," this is the best environmental book I have ever read. I was able to get through one chapter before I finally gave up. It is a interesting subject but is way to long and detailed. It will definitly put you to sleep! Really informative and eye opening report on our lives' dependence on oil. Interesting who are the movers and shakers of the renewable energy movement. I just read "The Lorax" to my kids last night. A very good read that mixes history, geography, technology and a bit of futurology. Simple but has an impact on the thinking man. Really interesting look at the past, present and future of energy and energy consumption in the united states. Very reader friendly and informative. Sort of an low level Hot, Flat, and Crowded by Thomas Friedman. I enjoyed it, but it was not compelling. The idea is that slowly people are buying into the energy shift/revolution.